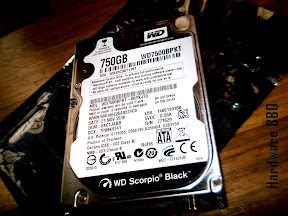 This is the second 750GB Notebook drive review I am going put up, this one is from Western Digital. Black series from Western Digital, as always pitched as a High Performance drives. Would you like to have one-or do you even need one? Here’s what’s up! The drive comes in an Anti-Static bag: the usual. The Controller is Marvell 88i9045-tfj2 controller, the same one viz. used in Westen Digital 600GB SATA 6Gb/s Velociraptor I’ve reviewed couple of weeks ago. The 128Mbit 16MB Cache is a Winbond W9425G6 JH-5 SD Memory and the motor controller is a Texas Instrument SH6601AF controller. 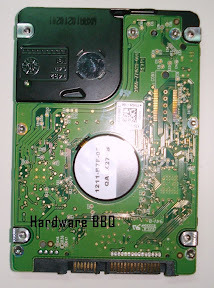 A foam sheet is sandwiched between the drive and the PCB. This is what I like about Scorpio Black drive and I used this drive for a while. The drive is quick on its feet when it loads up programs compared to the Seagate Momentus Drive I reviewed earlier. The Overall performance is good. 5 year warranty? Thank you Thank you Thank you! Just as an opinion, all internal drives should stick to 5 years warranty, irrespective of the newer versions/models coming out from any manufacturers. Its not yet available in India. I was being told that this should be available after a week or 2. Its more of a minor inconvinience rather than a con. Besides, newer versions of imaging software of 4k aware. Windows XP uses 512Byte alignment and if you’re going to use it on this drive, there will be a performance drop. Certain drives (usually the 3.5inch Drives)have pins where you can insert a Jumper and you go about and install the Image backup to use 4K alignment properly. In such notebook drives, you have to use image softwares like the newer Acronis that does the alignment for you. Chances of a person using a notebook with XP and going for upgrade is small, but its there nevertheless. But if you’re using a fresh install with Vista SP1 onwards on this drive, you don’t need to do worry about it. If you the U.S. and the U.K. price, its nicely priced. The U.S. price difference us $101.99 and $112.99. Make sense to pay the extra, especially for a 5 year warranty period and the performance difference. Its not everyday you get to change your hard drive. CPU consumption is also slow so that’s another plus point. Faster drive with faster boot load and program load-up is always appreciated provided the price is justified. I seriously doubt many notebook manufacturers would bundle this on most ultra high end notebook/desktop replacement units, but this makes a good upgrade especially for mid end notebooks. 7500BPKT gets my vote unless Seagate decides to drop a significant price tag. Still, I’ve asked if I could get a Western Digital Scorpio Blue 750gigs to match it with Seagate Momentus to see where they both stand against each other. Most of the notebooks let you use 1 HDD internally, so if you’re going to spend so much on a 750gig drive, you would take this drive a look. However, the true comparison would be Scorpio Blue and the Momentus drive, despite Black Scorpio and Momentus had few head-to-head moments. Edit (15-03-2011): Western Digital India finally announces it. 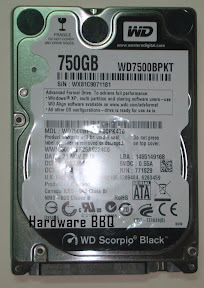 WD Scorpio Black 750 GB hard drives (model number WD7500BPKT) are available now at your nearest retailer. MSRP for the WD Scorpio Black 750 GB hard drive is Rs. 5275 plus taxes. WD Scorpio Black 750 GB hard drives are covered by a five-year limited warranty.